You would normally expect a teenage girl to be pretty excited about celebrating her birthday, wouldn’t you? But then Zahra Lari is not your regular teenager. Known in the UAE as the Ice Princess, the Emirati girl spent her 19th birthday on Monday training, hardly even having the time to cut a cake! Zahra recently became the first figure skater to officially represent the UAE in a competition as a member of the International Skating Union (ISU) last month in Slovakia where she finished 12th. The homegrown star’s ISU membership comes following the UAE Ice Sports Federation’s acceptance as a member in October 2013, making the UAE the first country in the Middle East to join. Membership to the ISU, the governing body for figure skating, is essential in order to enter major international competitions, including the Winter Olympics, which is her ultimate goal. Next on Zahra’s ISU competition schedule is the Sportland Trophy competition in Budapest, taking place from March 4-9, where she will take on 15 to 20 fellow world-class competitors. She left on Wednesday and in an interview to XPRESS talked about how times have changed since she began participating internationally in 2012. “It is very interesting how perspectives have changed in these last two years. Back in 2012, when I went to Italy for my first international meet, people, after finding out where I was from even asked questions like: ‘Do you have ice in the desert?’ I mean surely we can have ice rinks in any part of the world. But these days, they are more aware,” she said. Zahra, who trains at Zayed Sport City, has seen significant improvements to her performance following the venue’s appointment of world-class coach Zsolt Kerekes. Kerekes’ technical skill set complements the creativity of Zahra’s original coach, Noemi Bedo, providing for more balanced training. The training plan of four years involves practice six days a week. In years one and two she will master triple jumps so that the rotation reflex becomes automatic, while years three and four will focus on Olympic qualifications. Since her new training plan was implemented, Zahra has improved her personal best in international competition and has shifted her focus onto spins with higher levels of difficulty. She is now skating faster, more dynamically and with more elements. She is currently sharpening up landing the Salcow, toe loop and loop triple jumps, which are now 10 centimetres higher than before. “It was difficult in the beginning switching from one coach to another. But this new coach is amazing. My jumps are now much better and overall I am skating a lot better now,” she said, adding: “However, I don’t dream of winning in Budapest. The idea is to keep on improving my personal best. At Budapest I will employ new spins and a different technical programme. Understandably, Zahra was glued to the TV screens during the just-concluded Winter Olympics in Sochi. “It was kind of weird really watching the figure skating. I had a mixed feeling thinking I might be there in the next Olympics in Pyeongchang [South Korea} in 2018. But then, it also made me realise how much hard it will be to get there,” she said. The aspiring Winter Olympian continues to be a role model, both internationally and locally. 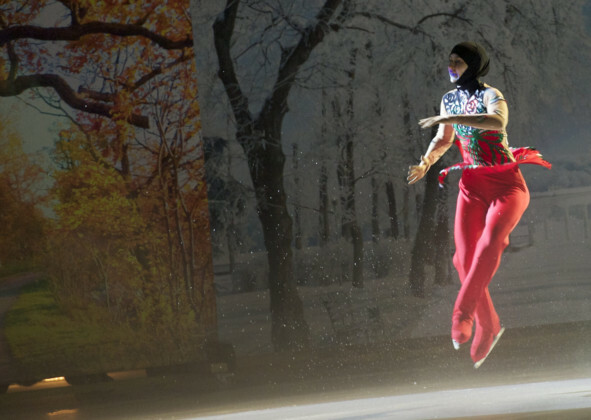 Zahra was recently featured in UNICEF’s “Voices of Youth”, and once competition season culminates, she plans to volunteer with the ice rink’s ‘Learn to Skate’ programme, encouraging young skaters to take up the sport. “Coaching is something I definitely like to do when I am not competing. I want to make the young skaters’ dream come true. I know it’s a challenging job, but I am looking to be a full-time coach in the future,” she said.